All weekend brunches should include a Bloody Mary made from scratch. 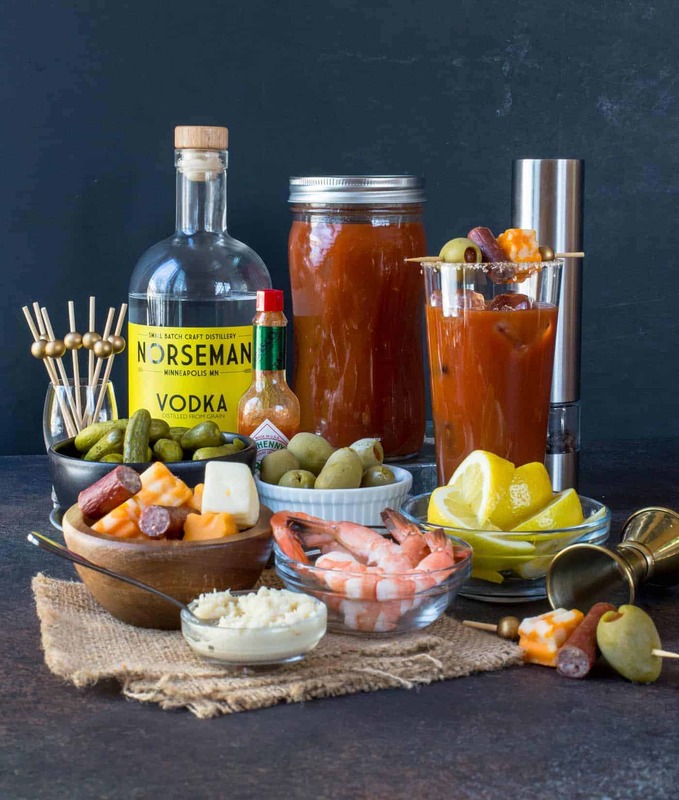 Set up this easy DIY Bloody Mary Bar and let your guests serve themselves! Either you love them or you hate them. I LOVE them and kinda believe that brunch and Bloody Marys were made for each other. Who’s with me? Cocktail making is an art, and this drink is definitely at the top of the list with the different variations that are available. And trust me, people are definitely particular with how they like to drink their Bloodys. That’s why I make things easy when I host brunch and set up a DIY Bloody Mary Bar. My guests do the work themselves and get to drink their cocktails exactly how they like them. Set out a variety of vodka flavors so guest can choose what flavor they want (or omit completely, if they desire). A couple of my favorites are Absolut Peppar or Norseman. You can even serve Dill Pickle Flavored Vodka- who knew that was a thing? Set out glasses and a filled ice bucket. Don’t forget the fresh lemon wedges and celery salt to rim the glass. Some people like their Bloodys HOT. Place fresh horseradish, Tabasco Sauce and a pepper mill for people to season to taste. Now it’s time for the garnishes. The sky’s the limit, but here are a few of our favorites: shrimp, salami, green olives, cheese and pickles. And you can never go wrong with bacon. This Candied Bacon is always a hit. Brunch cocktails made easy. And not a bad way to get your veggies in for the day. Don’t miss these other brunch favorites! Mix all ingredients in a cocktail shaker over ice. Strain into a highball glass filled with and garnish with olive and celery stick. Adjust seasonings for your personal taste preferences. 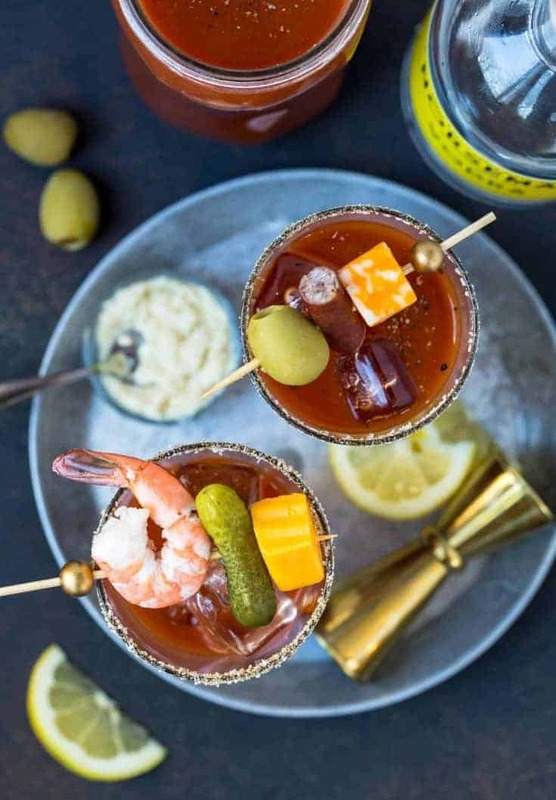 I have actually never had a bloody mary but now I want to try one because this looks great! Oh my goodness, I love these!! If I have these I just might start watching football! Bloody Mary’s are my go to brunch drink. yum! I need to make these! It’s about bloody time I make a bloody for myself at home! Definitely pinning this for our next football bash or brunch. this is one of my fave drinks and always reminds me of my dad!! Love it! Classic cocktail, so much better homemade! My husband is in love with Bloody’s and this one would be right up his alley! Football and Bloody Mary for the win! Very unique way to get your veggies! Yes please! These just scream brunch!